Is this Nokia's aluminum Lumia 1020? The Nokia EOS, rumored to feature a 41-megapixel camera, might ultimately be called the Nokia Lumia 1020. That's the name that will be revealed when the EOS is unveiled at a New York event on July 11, claimed Twitter tipster @evleaks yesterday. "EOS = Nokia Lumia 1020," the frequent leaker wrote in a brief tweet. @evleaks has a history of being right, but besides this potential name, little is known about the Lumia 1020 for sure. The Nokia EOS, codenamed "Elvis" and real-named potentially Lumia 1020, has a 41-megapixel camera - that much is practically for sure. Nokia even hinted at the spec recently by posting a "41 million reasons" teaser on its official site. Rumor has it Nokia is taking the PureView tech from its Symbian Nokia 808 PureView and putting it in this new Windows Phone shell. 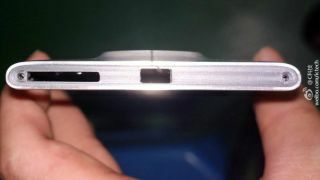 In supposed leaked images that emerged recently, you can see the alleged Lumia 1020's aluminum body and its massive camera hump. The Nokia EOS/Lumia 1020 is also rumored to pack a 4.5-inch, 720p display, a quad-core processor and 32GB of storage. With the Lumia 925 and Lumia 928 only just coming out and what just might be the 1020 about to be revealed, it seems Nokia is making good on its promise to offer a wide range of devices this year. Want all the latest Windows Phone news? Check out TechRadar's coverage of this week's Microsoft Build 2013 conference.